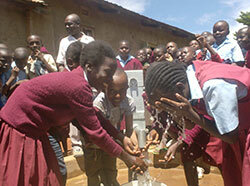 Establishing Community Water Well - Please help fundraise! In the United States, each morning some of us pour coffee, put on a radio/television, go to work/school, even a read a newspaper...enjoy a glass of water and a clean shower. In Kenya, Rwanda, Sierra Leone, Sudan, and Uganda, each morning there is a fight for the basic means of survival. Imagine not having clean water to brush your teeth, shower, drink, boil food? The goal of this fundraiser is to establish a community water well in Rwanda or another site in desperate need of a community well. Anything you can donate to contribute to this project will help benefit a community in need of the basic means for survival - water. 1 Billion people do not have clean, safe water. It is disturbing, outrageous, and something that needs to be fixed. Water should be readily available to all. For too many...dirty, diseased water leads to a cycle of sickness, lack of education, poverty and lost hope. It is needless suffering. Decide this has to change. Get involved. Help us build clean, safe water projects in the developing world. Thanks for your support and please share this with those who want to contribute to this community project.